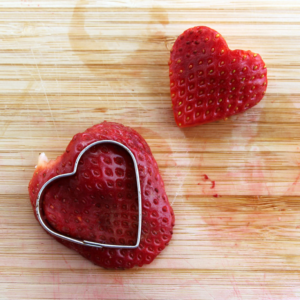 Make Valentine’s Day a family event! These recipes use fresh, organic fruits and vegetables that everyone will enjoy. Let your kids help in the kitchen – whether they are stirring in the ingredients for macaroni and cheese or adding the toppings for the pizza! Try our savory and satisfying baked carrot fries. They are perfectly crispy and packed with nutrition. Carrots contain vitamin K, beta-carotene, fiber, and potassium. 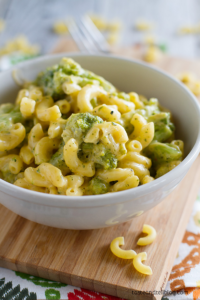 Get your family to eat their broccoli with these two dinners. Broccoli is full of vitamin C, fiber, vitamin K, potassium, and a significant amount of protein. This is a decadent mac and cheese from Taste and Tell Blog recipe with evaporated milk, cheese, and butter – but it is delicious! Broccoli is in season, so use fresh broccoli instead of frozen. Use a loaf of French bread or your favorite premade pizza crust – try Trader Joe’s Frozen Cauliflower Crust to add even more vegetables. Cut the loaf lengthwise and place on a lined baking sheet. Prebake the bread at 400 degrees for 5 minutes to make it crispy. Add shredded mozzarella or vegan cheese. Caramelize broccoli and red onion in a pan before adding it to the pizza. Over medium heat, toss bite-size pieces of broccoli and sliced red onion in 2 TBS olive oil. Use cherry tomatoes for a bright burst of flavor. For French bread pizza: lower oven to 350 and cook for 8 to 10 minutes. Keept it simple and put out a bowl of fresh blueberries, orange segments, and strawberries. 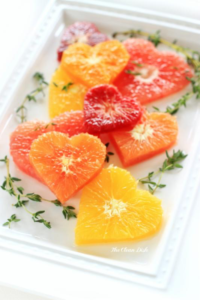 Use a small heart-shaped cookie cutter for the oranges and strawberries if you have one. I always keep a can of milk in the refrigerator for whipped cream. 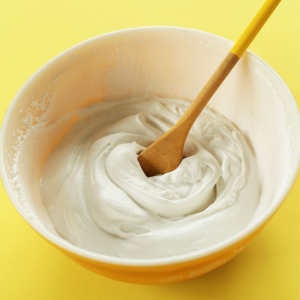 Keep in mind that the coconut milk needs to be in the fridge for at last 8 hours and you will need a chilled mixing bowl and an electric mixer.